Now, Google “Suggest” comes to mobile too ! Low cost internet enabled handsets, innovative data plans and introduction of 3G technology are all set to fire up the mobile internet usage in India in the near future. Not that mobile internet is not being used by people currently. According to a media article, the number of people already involved in tapping of mobile internet now has more than doubled, from about 8-10 million in the beginning of the year 2009. In fact, as per the data on usage of mobile internet, Google searches on mobile phones has witnessed a four-fold increase and that the company has witnessed an inflection point as on March-April last year in terms of traffic to Google Mobile. With so much of prevailing growth and potential buzz for lots more to come in the mobile internet space, it is but obvious that global internet companies like Google would come out with innovative features to hook in more and more internet users via mobile phones. In a latest initiative, Google Mobile Blog has announced the launch of ‘Google Suggest’, which is nothing but the same search-enabling feature one finds on desktops or laptops where Google suggests an answer to your search query by itself even before loading of the results page. The new Google Suggest also comes with Google’s Universal Search feature. 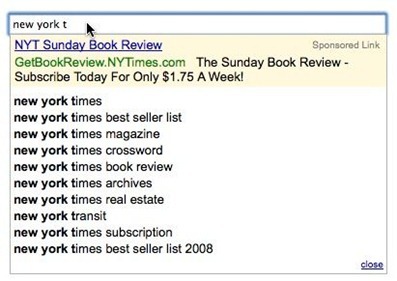 Google Suggest would bring information at the lightning speed with various options available for the nature of your query being searched, this even before you complete your search input. For example, let’s say you’re flying to London and want to know: Is my flight on time? Or what is the exchange rate of the pound? 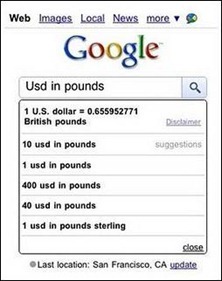 For Eg: As you type the flight "USD in pounds", the answers are provided right below the search box, without having to wait for the results page. However, this feature, I presume is probably more than suggestions and links – I am sure Google will very soon introduce advertisements or sponsored links within these mobile search suggest drop-down, like it has done for their normal web search. With Millions of mobile users using google to search, this is definitely another channel to exploit and make some big bucks ! What say guys? 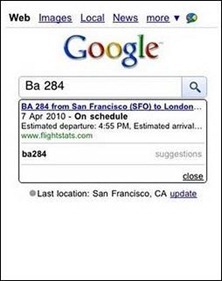 Do you see Google Mobile suggest introducing this soon? Who Watches IPL- A Comprehensive report! Interesting and useful internet tip!! !